One consistent factor among 3 of the major top end manufacturers was their desire to partner with Codex for their on-board recording solution. Starting with Arri, who have been working with Codex the longest time, their new ( ish ) launch of the Alexa SXT ( Super Xtended Technology ) camera allows you to get even more from the existing block, and I really like that Arri will upgrade all existing Alexas to the SXT with a software mod, rather than asking their loyal clients to buy a whole new camera. Canon made the decision to announce their big news, the new EOS C700 camcorder, the week before the show, so the press release didn't get lost in all the mid-show PR noise. It clearly worked as the crowds around the stand were significant. The Super 35 format camera records both internal 4K ProRes and XF-AVC, and the camera also has a Codex processor board in-built. Their Codex recorder integrates nicely on the back of the camera and can then record uncompressed RAW at 120 fps. The units on the stand were pre-production models, with delivery of working models towards the end of the year. It's available in either PL or EF mount from the factory, and I like that it can be swapped between PL and EF mount by sending it back to the Canon if a client needs the other mount fitting. 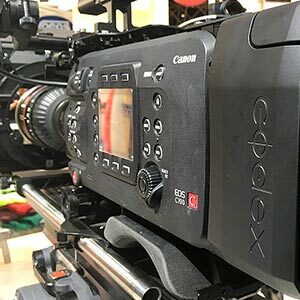 Panasonic were the other leading manufacturer to adopt Codex technology in to its Cinematography offering. The new "Pure" camcorder utilises the Codex technology and will also record 120 fps of RAW, this time V-RAW, Panasonic's Varicam variant of RAW. Of the 3 companies, Panasonic has the least heritage in top-end drama, but the pictures and feel of the camera felt good to this untrained eye, and it will be interesting to see who prevails. The original tape Varicam was the "go-to" camera for wildlife photographers back in the day, and Panasonic were able to recreate the "look" of the original Varicam in the tapeless Varicam35. Whilst it was not widely taken up, cameramen that I know and trust felt it was a "proper" camera, built with the cameraman in mind, if perhaps a little heavy for shoulder-mounted work. The subsequent VaricamLT has been more successful with a slightly reduced feature set in a much smaller form factor. I see this progression continuing with the Pure, and the Codex collaboration should help Panasonic gain ground in the most demanding of camera sectors. It does seem clear that Codex is perceived to be the strongest partner to help them all succeed in this market. Based in the heart of Soho post-land, they understand what is required of a manufacturer, and are meeting that need pretty well. They've been in the top-end drama and feature film space for so long now, and having spent time with them at IBC it's pretty clear they are a main cog in the on-set production workflow. I also like that they are also keen to help up-and-coming film-makers and do offer some altruistic assistance where possible for low budget projects needing to borrow some kit. It's always good to see companies giving something back. RED buck the Codex trend of direct collaboration, as they so often do, and their technology continues to push the boundaries. I confess to only having the briefest of visits, such is the scale of IBC, but their upgraded 8K Weapon and Helium products are leading the K race. The display technology isn't yet widely available to view the full resolution of the camera, but the ability to crop the shot and still have sufficient resolution allows the director / cameraman some latitude to get the shot they really want. The data rates must be immense. Moving on to the more main-stream camera announcements, Sony launched the only shoulder mount 4K camcorder at the show, the PXW-Z450. It has a single CMOS sensor, 2/3" mount, but contrary to most single sensor cameras the depth of field resembles the traditional 3 sensor look with a deep depth of field that a jobbing cameraman would appreciate. Panasonic announced two 4K handy-cam style camcorders, the AG-UX90 and UX180, with launch dates later this year. Their form factor is in line with previous Panasonic models and both feature a MOS sensor. The UX90 has a 15x optical zoom and can record up to UHD 30P, whilst the UX180 has a 20x optical zoom and can record up to UHD in 60P. Cleverly, the AG-UX180 also supports dual codec recording, and has a handy infrared recording setting for extreme low light shooting. Panasonic has led the market in PTZ cameras for some time now, and new for the show was their weather-proof model. It has the internal chip set and workings of their flagship HE-130 camera, but fitted with its very own crash helmet and windscreen wiper to protect it from the British summertime weather. JVC had their GY-HM660 model on display and they have been pushing the ability to stream straight from the camera for many years. This model is the next step and claims that the software algorithms will cope with a 50% packet loss before any unacceptable picture loss is noticeable. I confess that I didn't see this in action, but this level of flexibility in a news environment where speed-to-air trumps image quality is surely beneficial. On to camera channels, and Ikegami has a new spring in its step, and were showing off their impressive 8K studio camera, but are more likely to find some immediate traction with the 4K UHK-430 studio camera. The data coming from the camera head is uncompressed 4:4:4, higher than any other I'm told, and gives some stunning pictures. The recent successes for Ikegami have almost exclusively been centred around Northern soap operas, so let's see if there are any more takers in a Live Production sector dominated currently by Sony. With minimal units currently in the hire market, a studio or OB client looking to own their core inventory and hire in for peak periods may find it difficult to choose Ikegami, but for stand-alone, self-sufficient set ups where there is no hire requirement, Ikegami could be a good option. And I'd say this even if I couldn't offer an interest free finance option on these units. On to lenses and there is a move for greater flexibility from 2 of the leading glass manufacturers, with both Zeiss and Cooke offer interchangeable mounts on their lenses. Zeiss were making a big noise over their award-winning new lightweight zoom. The 21-100x zoom lens sits perfectly on the ubiquitous Sony FS7, and with no need for a speed-booster due to the interchangeable mount, it should do well. It's a little more expensive than the FS7, which is exactly as it should be. This lens will still be in use 10 years from now, which is more than can be said for any camera bought today. Cooke also announced their "multi mounts" mod which allows the Classic and Pancro primes to switch mounts between PL, EF, E and MFT. There has been a move in recent years for a cameraman to buy a lens, but rent the camera, such is the relentless release of new camera models. But what lens mount does a cameraman choose? This new functionality from Cooke and Zeiss solves this problem.